Notes: Ex-UP "City of Albert Lea"
Description: This was the first ICE unit I ever caught, and it was east bound on a BNSF train. Cool looking unit. Description: My first shot of an ICE unit, being a visitor to BNSF rails, and sadly trailing. Description: An Iowa Chicago & Eastern SD40-2 is the second unit on an empty taconite train on BNSF's Birmingham Sub. Description: BNSF Dash 9 4828 and a visiting IC&E SD40-2 head through Galesburg with a taconite train. Description: The last unit on the train. This will be the power for 943 later in the night. Description: M-SPKC rolls into "Norma" on a sunny Saturday morning. The SOO GP38-2 #4508 was a bonus! Description: M-SPKC just south of La Crescent, rolls into one of the many curves on this line to Marquette Iowa. Description: BNSF #709 is leading CSX #5455, CSX #7879, and IC&E #6428, on train H TULGAL 9-26, Eastbound past the fairgrounds in Sullivan, MO. Title: ICE 6428 Mason City Sub. Description: Nahant is starting to look like Galesburg, just a different color. Description: A short WB freight blasts through Columbus at dusk. Description: ICE 6428 leading a WB combined freight and ethanol on the Waseca sub at Dodge Center. Title: ICE over Front St. 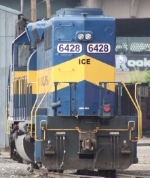 Description: ICE 6428 "City of Albert Lea" at Marquette, Iowa.